Dis is Brennus. Amy is off somewhere writing Iniquity so Finn and me came ta take care o' tings. 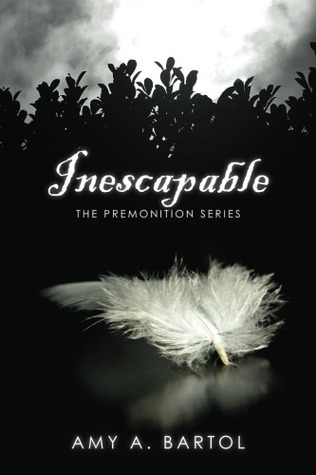 In honor of the release of Incendiary, Amy plans ta give away one signed copy of Inescapable: The Premonition Series on Goodreads.com. I warned her dat nuting in life or undeath is free. She said dis is. I told her dat no good deed goes unpunished. She rolled her eyes at me...she'll learn. Ta enter, ye'll simply have ta click on da "enter to win" button below and follow da link ta Googreads. Dis is an **INTERNATIONAL GIVEAWAY. ** Do na banjax da drawing--scan da rules on Goodreads.com before ye enter. Do it now; do ye need more tellin'? Oh, and Finn says dat da contest ends December 24, 2012...ye're almost out o' time. Giveaway ends December 24, 2012. Available Now in Paperback at Amazon.com! Aahhh, Amy! Great giveaway...just hope Brenn and Finn don't banjax it for the rest of us! Oh Brennus... Love to hate ye! Amy we need a new poll now since there's a new team - team Xavier! I'm still team Reed though... Merry Christmas and happy new year (happy because Iniquity will be published 2013)! Haha i love you brennus(you too finn) you guys just made my day!!! even if i was too late for the giveaway!!! Merry christmas Amy !! Did anyone else read that in an Irish accent?? I just heard about this wonderful series from a friend at work. I have read all four of the books in little over a week!! I could not put down my iPAD:-). Can't wait for the next book!! Thank you for a great story. Thanks Brennus! One of my FAVORITE posts ever! I love Brennus he is one of my favorites in the series. You love to hate him and you hate to love him at the same time. I couldn't have been more excited when I got to the last page of Incendiary and found that there was another book in the series and a teaser chapter has me going crazy. Can't wait for Iniquity bummed I missed the contest but this post made me smile all the same. Hi Amy! Just finished book 4! CANNOT wait for book 5! I have a song that I think symbolizes Evie perfectly . . . Diamond Eyes by Shinedown. If you have not heard, you have to listen to the lyrics. I feel this song sums up Evie and her purpose! Thank you for writing these books! Can't wait for Book 5! I loved all the books, and can't wait for the next one. I would love to see The Premonition Series made into a movie.